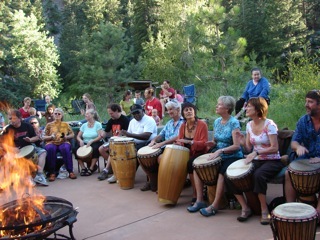 When DRUMMING is present in COMMUNITIES, a sense of rhythm and harmony are created that transcends language so that when we do speak there is another level of understanding. 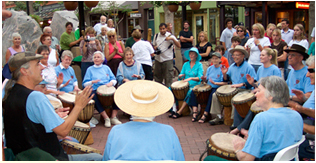 Here at COMMUNITY DRUMS we believe that DRUMMING is a vital daily event, just like eating, sleeping, walking and talking; and we have lots of fun, accessible ways for anyone & everyone to be included. 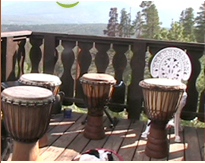 For the TEACHING of the MEDITATION/CELEBRATION rhythms & technique we use the ever popular West African DJEMBE Drum - however - some of the technique & all of the rhythms are transferrable to any drum - be it Dumbek, Conga, Hoop Drum, even Percussion! There are always rhythms to play-along-with as well as our own color-coded tablature downloads - FOR FREE! "WE COULDN'T HAVE DONE IT WITHOUT US! ALL OF US!" Thank you for exploring our website. We're sure you'll find it enlightening, informative, and entertaining. Oh yea! 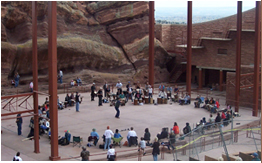 - be sure to have a DRUM nearby!